I am throwing up a quick post about a relatively cryptic error that Solr started throwing the other day here at Plaxo. After happily running for a few days, I suddenly started getting pages about failed Solr indexing. I tried to see if sending an OPTIMIZE command would help but the server returned the same response. Update: The author of the module contacted me the same day and promised to fix it in the next version. Version 0.40 was indeed on cpan as promised, but I haven't tested it yet. Passwd::Unix will corrupt your /etc/shadow file and rearrange login names and their corresponding password hashes. Attention: Apparently since the release of 5.1.25, cluster is packaged separately. I need to do some reading and research first and then update the tutorial with the latest info. Here are some quick links for now: http://blogs.mysql.com/kaj/2008/05/23/mysql-clusters-improved-release-model/, http://johanandersson.blogspot.com/2008/05/mysql-cluster-62-officially-released.html, http://blogs.sun.com/theaquarium/entry/improved_release_model_for_mysql. April 14-17th is going to be an exciting time. Why? Because the 2008 MySQL Conference and Expo is going to be held in Santa Clara, CA. Who would want to miss out on a chance to lurk around, let alone talk to, some of the smartest people in the MySQL world? Well, those who don't have at least $1000+, of course. A 3 day pass to the conference without tutorials costs a whopping $1199. A full pass would dry up your pockets $1499. Pine is a UNIX command line mail application. So how do you delete all messages in a folder? then you don't have a check in the "Enable aggregate command set" settings checkbox. To enable it, go to the main menu (M) -> Setup (S) -> Config (C) and scroll down to "Enable aggregate command set". Then press X (to check it), E (Exit). Now repeat the above…. I don't know about you but I've had a lot of problems making screen work nicely with YaST. 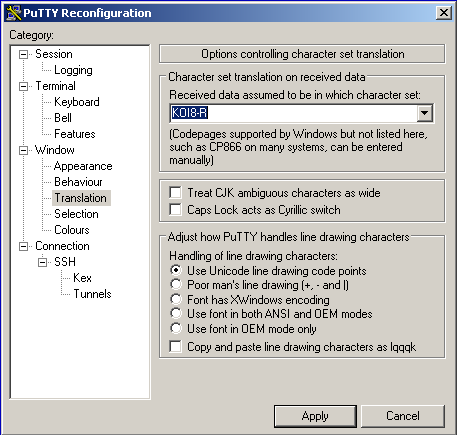 Both putty and SecureCRT had major problems displaying YaST's ncurses interface. The screenshots below depict the problem quite clearly. If at this point you don't see anything like this, you are most likely not affected and can go get a beer. sysbench – Linux test bench. Easy as pie to test CPU, memory, threads, mysql, and disk performance. full). This allows you to watch the program output change over time. So today I was looking for a proper sources.list file that would work for apt-get in SUSE 10.2 since the one in yast and smart repositories comes with a broken list. And by broken I mean completely f***ed. introduce the new Linux section of the site (specifically dedicated to openSUSE). provide a very short description of Linux and compare it to other operating systems. I'm a Windows user, I admit it. Not because I enjoy frequent reboots, freezes, and other unexplainable quirks. It's mostly because I have so many programs I'm used to, it would be impossible to switch to anything else, and I know ins and outs that allow me to be very comfortable with the Windows. I'm talking 20-30 programs I'm not willing to give up any time soon. Installed Ubuntu LTS 6.06 as a 2nd OS on my Dell E1505 laptop today after delaying doing this for a while. This article from digg finally made me install it, which took roughly 10 minutes, as it mentions. Compare this and 0 reboots to 45min and 5 reboots installing Windows. Ubuntu's pretty damn sweet; I'm gonna go tweak it now with the help of Arthur. I'm predicting that Linux (and Ubuntu in particular, as of now) will eat up Windows' market share surely and quickly. The dual boot is very friendly, it uses GRUB as the boot manager. To boot directly into Windows by default, I edited /boot/grub/menu.list from Ubuntu….
.: 76 queries :. : 0.159 seconds to generate cache :. : nexus2 :.